Remember Stacks? These days I keep my Dock hidden at the bottom of my display, with Stacks occasionally providing quick shortcuts to downloads and recent documents. My workflow is funny since I don't quite want to work in full-screen mode in most applications, but I still want to have windows fill the display. This way I can still bring up my Twitter app without switching to another window, I can use a hot corner to temporarily hide windows as I access whatever mess is on my Desktop, and I can quickly bring up the Dock without swiping down twice. Too, I have the benefit of bringing up a Finder window when I need it — more often than not I'm accessing the Downloads folder from a stack for press kits, images, and files I grap from our work channel. Trickster, a rebranded Blast which I reviewed a couple years ago, fixes having to go through the motions of unhiding the Dock, opening my Downloads stack, then clicking the "more" button or on the file itself. Basically, Trickster is a quick-access panel for applications, documents, music, photos, and video that supplants Stacks and All My Files in the Finder. Since Blast, Trickster has undergone a complete redesign. It certainly looks a lot nicer — it feels like there's less clutter and more focus on bringing up files. I liked Blast, but with Trickster I can say that the interface feels less jumbled and more streamlined. As with Espionage 3 and Fantastical, an anchor gives you the ability to pin Trickster above your app windows. The gear icon leads you to your preferences, while the five buttons at the bottom left give you quick toggles for actions, views, and sorting options. It's pretty easy to use. For those unfamiliar with Blast, it was an app that bubbled up your most recently used documents and applications in its window. It was simple to use, and it expounded upon the Finder by giving you quicker access to the items you were most likely working with. Trickster builds upon that, making the app itself easier to use thanks to the aforementioned button layouts, and it provides much more functionality thanks to some clever interactions. Favorites provide an area for items you always want access to, while flagged items can become temporarily pinned to a Flagged folder (not dissimilar from starring items in Gmail). 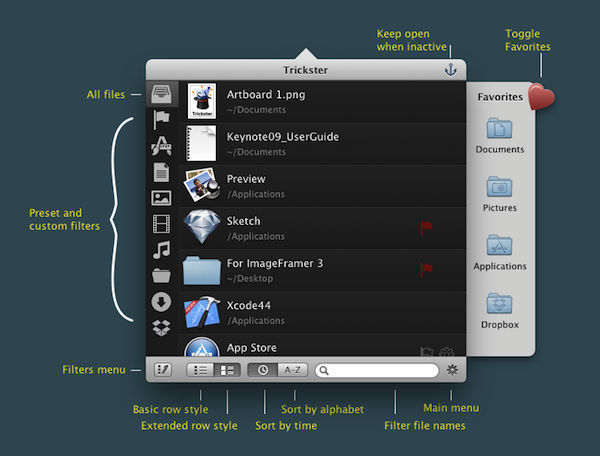 Where Trickster does the trick for me is with its keyboard navigation. Control + Z is Trickster's default global shortcut that reveals the app window, which can then be navigated using just the arrow keys. The spacebar will allow you to preview that file, while pressing enter will open that application or file. With an item selected, Command + M is the keyboard equivalent of right-clicking, bringing up the context menu to let you reveal a file's location in the Finder or open it with something other than the default application. It's a fast and convenient way to navigate all of the sidebar items and their contents. Trickster is so good at what it does that it's aggressive in how it displays recent items. When using Messages beta for example, saved conversations will be shown as recent items as chat logs are saved. Trickster can somewhat deal with these annoyances by allowing you to create filters: I can simply have Trickster ignore certain documents by adding my own custom sidebar items (or by right-clicking and editing the existing sidebar icons). Another cool feature Trickster has in its hat is the ability to drag items from the app window onto your Desktop or into a Finder window. If you want to quickly move a recent file to your Desktop or Dropbox folder for example, its convenience of immediately showing the file and allowing you to drag it to a new location means you no longer have to open two Finder windows to move stuff around. Trickster saves time — it replaces Stacks and the Finder by giving you instant access to recently used documents by bubbling them up in an interface that doesn't disrupt your workflow. While most users would be perfectly fine clicking around the interface, I definitely prefer jumping around with keyboard shortcuts. 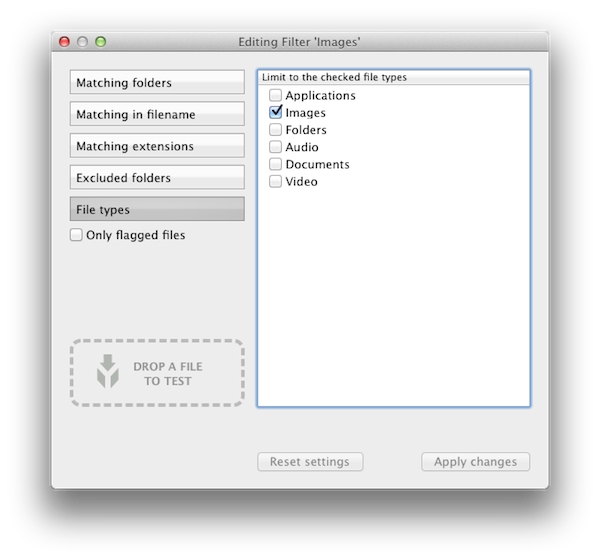 Use Trickster to reopen recently closed applications, bring up new photographs, find recently edited videos, figure where a document exists in the filesystem, use it as a basic document manager, or use as a tool to simply watch the Downloads folder. 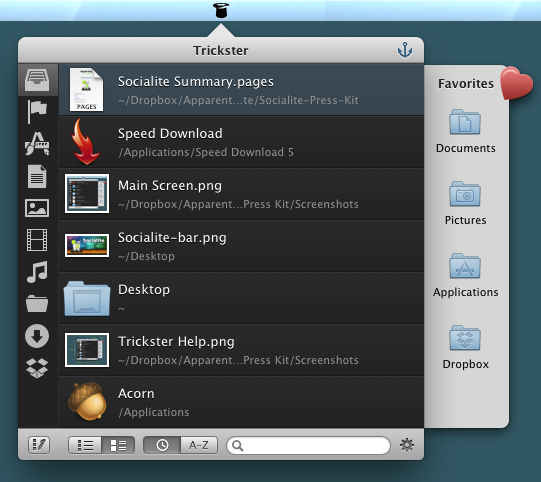 Trickster is currently $4.99 in the Mac App Store, but will be $9.99 starting on June 11th.